Jerry Wood passed away on March 23, 2014 from Multiple Myeloma. 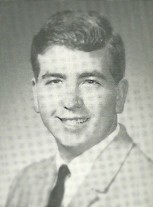 He was married to classmate Judy Rowley for 46 years. They knew each all through school and started Kindergarten together in the W. A. Anderson building. Jerry was a Pastor. In addition to his wife, he leaves behind his three children: Jeremy, Jonathan, and Julene, and five grandchildren.